Last minute decision to venture out for the first time this year. Struggling to find open all year sites close enough to home to justify just a two night stay. 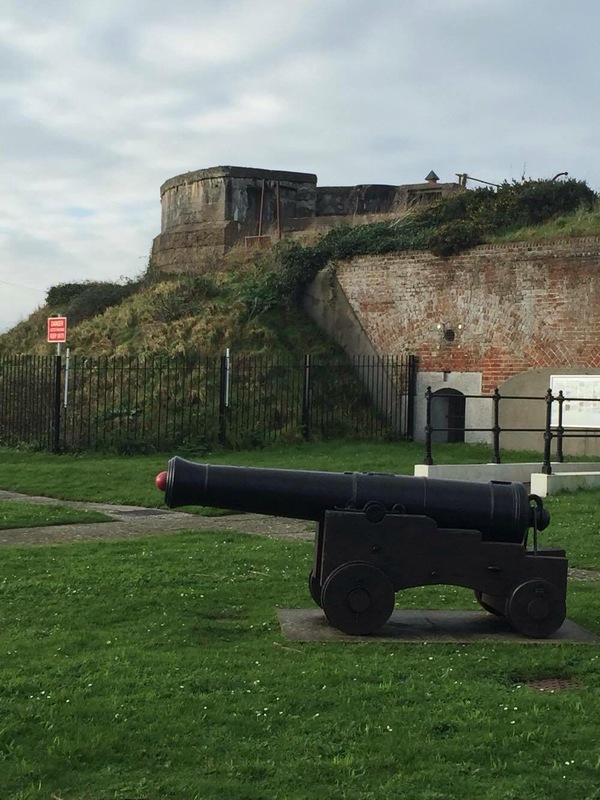 After deciding that I wanted to try somewhere new and some internet trawling, I found a site recommended on a caravanning Facebook group in Gosport. Situated near Stokes Bay in Hampshire, the park caters for tourers, tents and has static caravans on site. 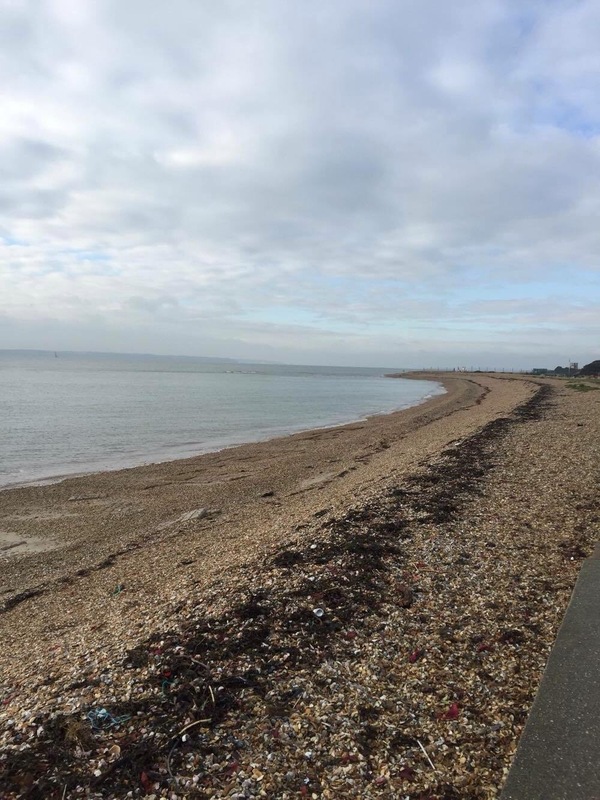 The site boasts having won the Gosport Council Accessibility Award for disabled visitors and also have the David Bellamy Awards for commitment to preserving and improving the coastal environment for flora and fauna. Given all this it was a very wet , dismal and gloomy arrival on site. After the wettest December on record for over 100 years the site certainly had its fair share of puddles. A very basic shop/reception greets you on arrival and the staff seemed friendly enough. The site has a clubhouse and restaurant where wifi is freely available. We couldn’t access the free wifi from the caravan but did have a 4G signal. We don’t normally choose sites with a clubhouse as they are normally a little livelier than we would normally choose. 5 days into a very wet January I don’t think the site is going to be too lively. Time for lunch, sandwich and a cup of tea in the new mugs our girls bought us for Christmas. Heating on, sit down with a little bit of Jeremy Vine for company. This is almost perfect, we just need the sunshine to make an appearance to brighten up a really gloomy day. Mid afternoon, a break in the clouds and rain and we were able to venture out to fill the aqua rolls up. A small, warm and clean toilet block services the tourers. Not sure at this point how you shower and keep your clothes dry in a cubicle without a shower curtain, I suppose I’ll work that out in the morning. The grass is very boggy and the rough track around the site is very wet and muddy underfoot. Walking boots and wellies are going to be the fashion accessory this week. Due to the amount of rain that we have had the site are advising parking your car in their visitors car park. Pitches are rough gravel and quite narrow, an awning would have to stand on grass and no hard standing space for cars with your unit. It’s amazing how a little bit of sunshine, no matter how weak and watery can lift your mood and make places look better. 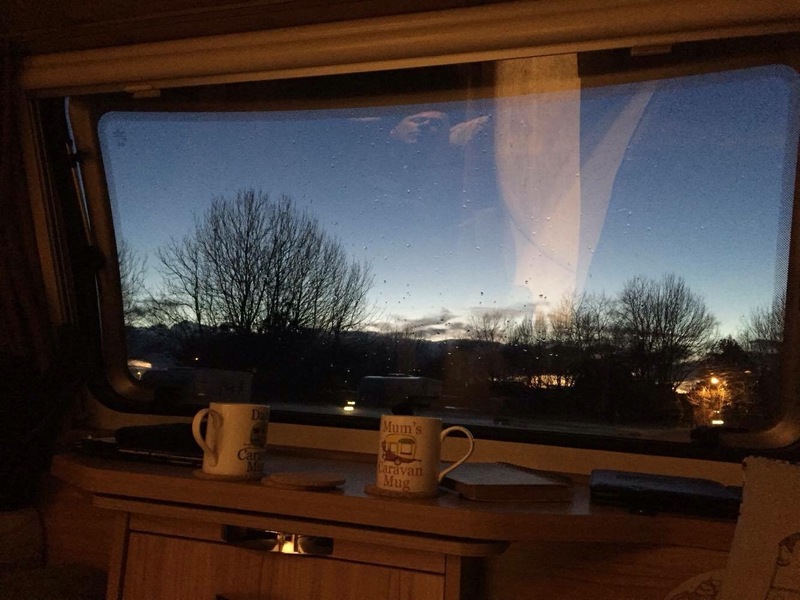 Just a smudge of blue sky is enough to lift any caravanner’s spirits. 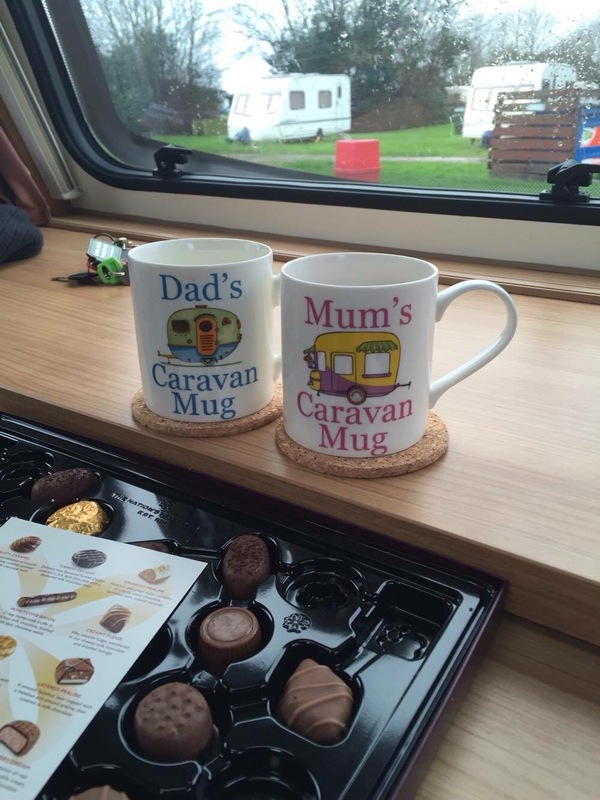 A choice of making our caravan a TV free zone means we listen to the radio, read and most importantly of all, people watch and watch the world go by. To do this to the max we love the single main window at the front of our Bailey. It offers an uninterrupted view of the world outside our window. This evening we were treated to a very weak sunset through the trees, which with yet another cup of tea to me is better viewing than any TV. After a curry for tea we decided to ditch the tea and opt for a cold, fruitier tipple. One glass down we went for a trundle, attempting to walk off a month’s worth of gluttony, around the site in the dark. Avoiding the puddles was a bit like attempting the Krypton Factor Course. I love an early evening walk around caravan sites. People normally leave their blinds open for a little while giving you the opportunity to have a peek inside. Seeing inside other people’s set ups at this time of the day is like having a little look into their lives and wondering what their stories are. Are they like us? Just away for a couple of nights? Other ‘vans look a little more settled, are they living in them full time? So many questions and no answers tonight. Everyone has closed their blinds and lives to the world. After having attempted to walk the curry off it’s back to the warmth and dryness of our second home just as the rain returns. Better finish the bottle, don’t want it going off. After more rain during the night, we awoke after sleeping really well, to a damp but rain free morning. Breakfast done, we decided to walk further and try to find the beach that is apparently within walking distance. Upon leaving the site we headed down the road and lo and behold just a 10 minute walk away was the sea. 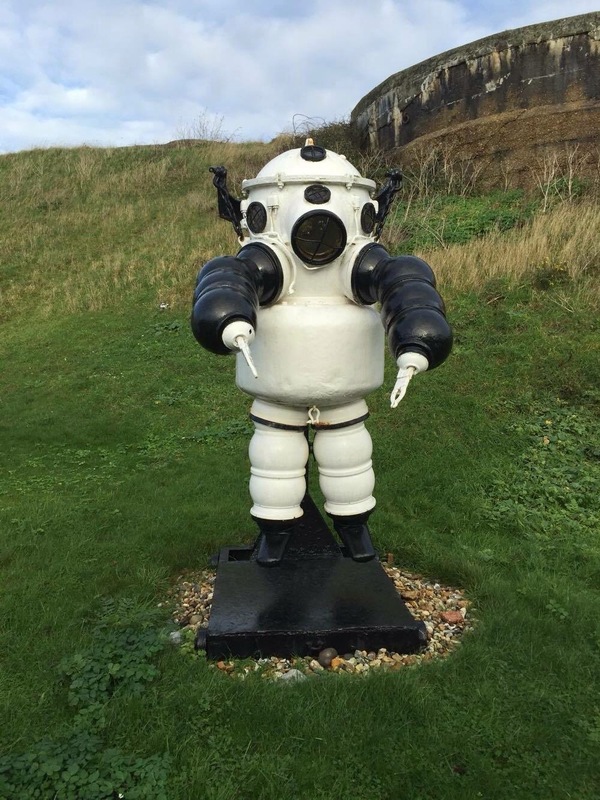 On the sea front is a diving museum, housed in a very impressive looking old Victorian Battery, sadly only open weekends and bank holidays between April and October. Looks like it could be quite a good way to pass a couple of hours had it been open, entry prices seemed reasonable too. 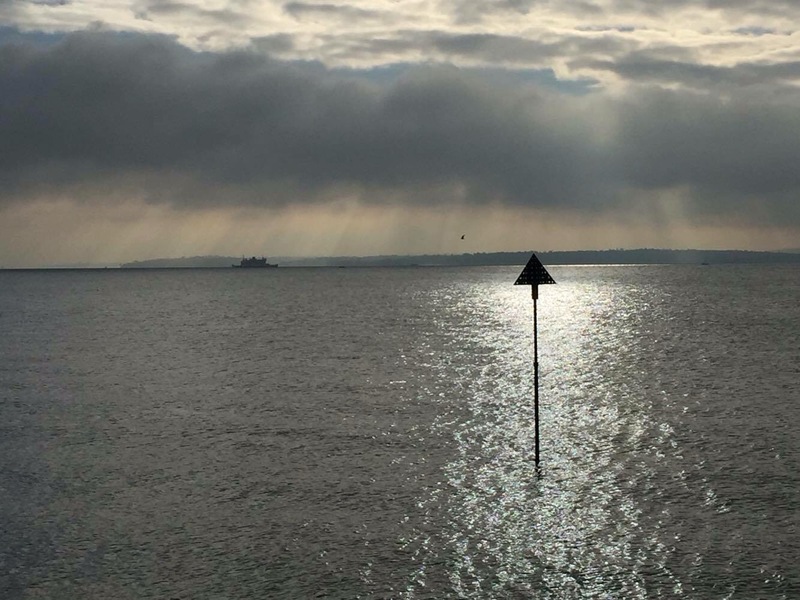 We strolled down the “Golden Mile” (don’t think Blackpool) promenade alongside a sweeping shingle beach, watching the ferries crossing the Solent to the Isle of Wight as the sunlight hit the sea in searchlight patterns. There were a number of Cafes dotted along the front and all seemed popular for the time of week and year. We reversed the walk, this time walking along the beach at the sea’s edge (note. No dogs allowed on the beach during summer months). Back at the caravan for soup and hot drinks while we watched a tradesman effecting a detailed repair on the roof of a nearby Motorhome (of considerable age – the Motorhome, not the tradesman). Hopefully a good job as the heavy rains are due back again this evening. Why is there a therapeutic pleasure in watching someone else working hard, I wonder as I turn another page of my read and take another sip of coffee. After the obligatory afternoon nap the rain started again. We set about trying to plan our 2016 trips out. It’s hard deciding whereabouts in the UK we’d like to visit and when, after doing French Alps in 2015 we have committed to a UK only year in 2016. After tea the rain was still coming down so we pulled the blinds and settled down with a small tipple and a playlist of music from our youth (basically, any music from ’77-’82 mixed in with old favourites from the 60’s/70’s first heard in the back seats of our parents Ford Zephyrs and Opel Asconas on route to some exciting camping trip to Devon, oh, and maybe one or two songs from now, not too many though) . As bedtime approached the wind started to get up. We spent quite a disturbed night as the wind blew in 50mph gusts off the sea and buffeted its way around the caravan site. Watching the site getting battered by the wind at 3am was quite eerie. The younger trees appeared to be bowing to the wind and the rain came down sideways. Oh the joy of winter caravanning. The night finally settled around 4am when nature decided we could sleep. We awoke to a very weak and watery sunshine that seemed to be trying to make a very wet and boggy site look a little bit more attractive. On reflection, the site felt very dated and lacked small details found in most Club sites or other well run sites. For example, long stretches of yellow tape to isolate zones just looks naff, water taps hanging off wall fixings could be easily repaired, and generally untidy areas including old vans used for storage etc gave negative vibes that would be so simple to put right. On to our fellow tourers, or were they? Of 20 or so touring caravans on site we actually wondered if we were the only caravan there on a break. 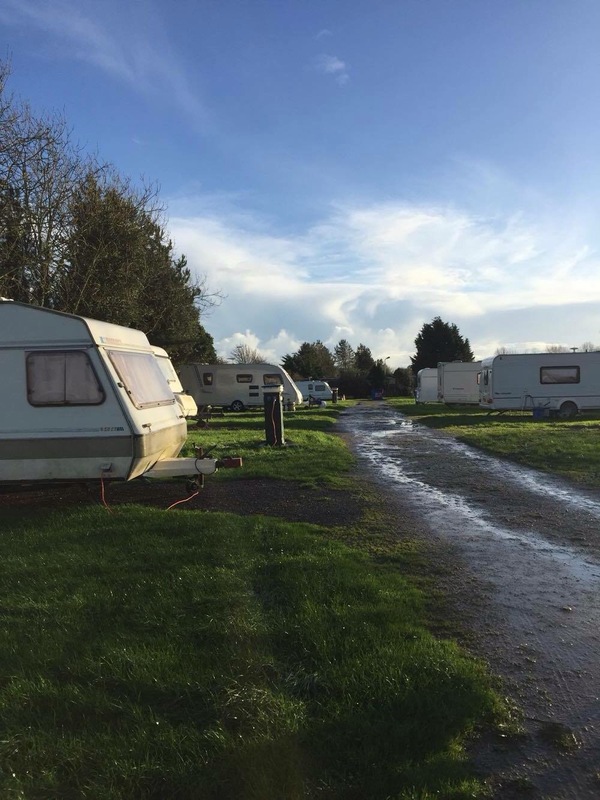 We have no issue with people living in caravans for economical or employment reasons, but you do get a more “chirpy” upbeat conversation when people are on site for pleasure. In fact, curtains seemed to never open despite people coming and going. To be fair, we would not class this as a bad experience, as we “make do” very well, but would we rush back, maybe not. We do like a variety of different sites. The one in Portsmouth was also one of our first trips out. You learn by your mistakes. You can’t beat a good CL!